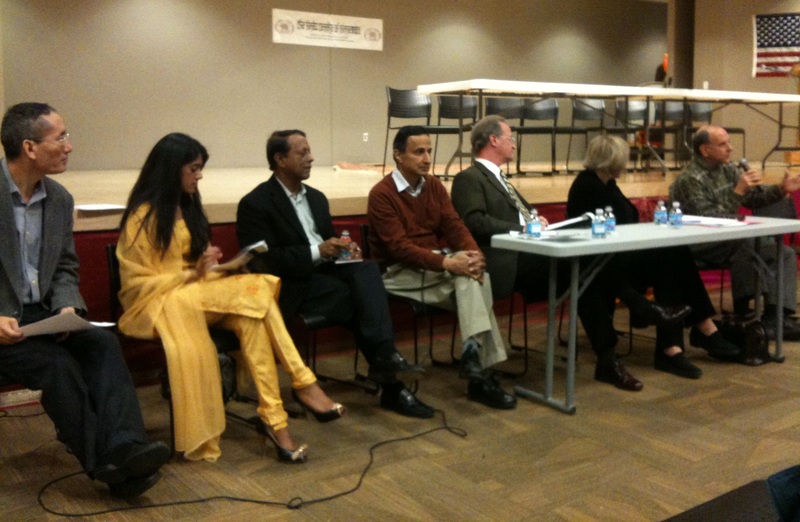 The South Asian Townhall meeting of December 2011 was held at the Hindu Temple of Minnesota. The purpose of the town hall meeting was to hear the South Asian community’s concerns for the upcoming 2012 legislative session and to engage in an open discussion with the elected officials. For many of the elected officials, this was the first trip to the Hindu Temple of Minnesota. Rep Debra Hilstrom (District 46B), Rep Joe Mullery (District 58A), Rep Sandra Peterson (District 45A), and Senator Warren Limmer (District 32) were present to discuss in an open dialogue with over 30 community members from the South Asian community. Council on Asian Pacific Minnesota’s Executive Director, Kao Ly Ilean Her, opened the meeting with an introduction of CAPM and the legislators in attendance. The town hall was followed by legislators discussing their priorities for the 2012 legislative session, an open discussion with community members to ask questions and to hear responses from legislators, and a reflection from the panel which consisted of legislators and CAPM board members. and employment and corporate hiring. Senator Limmer thanked the community for giving him the chance to attend and noted that meetings like the South Asian town hall is the best way to hear from the community and to bring their concerns back to the legislature. Thank you to all the attendees of the 2011 South Asian Community Town Hall. To view photos of the event, please visit our flickr page. How does the US immigration system affect us? In Minnesota, 62% of Asians are foreign born, and in the United States, 65.9% of Asians are foreign born. Like many other immigrants from around the globe, the United States of America became my home in 2000. I am ethnically Indian and my birthplace is Jeddah,Saudi Arabia. My family came to the US in search of a better lifestyle but due of my immigrant status, I face constant restrictions in education, employment, travel, and civic engagement. Under these conditions, our immigration system renders more value to an immigrant’s status rather than the immigrant herself. As a current university student, I know that financial aid is essential for access to higher education. However, federal financial assistance is denied to students who are not U.S citizens or permanent residents. Certain scholarships are out of reach for many immigrants because U.S citizenship is a pre-requisite. Even private loans require a co-signer who is an U.S citizen or permanent resident. For many immigrants seeking work, an “Employment Authorization Document” (EAD) is often required for legal employment. However, many complications can occur while securing an EAD, such as delays in issuing an EAD or limitations on where one can work. The ability to travel has also affected my family due to the restrictions in the immigration system. When my grandmother fell seriously ill, my father was unable to visit due to limits placed on him due to his immigration status. It is unfortunate that my father contributes just as much as a citizen would to the well-being of this nation, but he is denied this basic right to see a loved one. I know that many immigrants share the above concerns and more, but our voices are silenced by the fact that we are limited in our ability to vote or advocate on immigration reform. I call this country my home like many others do, yet I am barred from participating in the voting process and my voice does not carry the same weight when contacting a congressperson. This is a nation of immigrants that flourishes each second with their successes, expertise, cultures, faith, and values. Why is this immigration system deciding to suppress them? I want to reaffirm that as immigrants, we matter to this nation and it’s time to voice our concerns in reforming the immigration system. I urge you attend the November 9th roundtable to discuss how immigration affects our communities. The concerns, views, and discussions will be collected and submitted to both the Minnesota congressional delegation and the Obama Administration. Mariam Mahmood would like to thank Brian Kao for his assistance in the writing of this piece. Between 2000 and 2010, South Asian communities in Minnesota more than doubled from 18,468 to 38,246. The Minnesota South Asian community’s recent drastic population increase portrays the significance of immigration and its implications. This illustrates a new era of immigrants that will shape the policies for the upcoming years. Our understating and engagement in recognizing their needs and concerns will enable our state to handle the immigration issues justly. Wednesday, November 9, 6:00pm – 8:00pm. Comments Off on How does the US immigration system affect us? The Council on Asian Pacific Minnesotans is organizing a South Asian immigration roundtable. The roundtable may be first in a series of several roundtables to better inform policy-makers and community members on how the immigration system affects Asian Pacific Minnesotans. America is a nation of immigrants and as we work to rebuild the economy, our ability to thrive depends, in part, on restoring responsibility and accountability to the immigration system. We are seeking a diverse group of stakeholders who care about addressing the concerns and needs of those affected by immigration to provide their voices at the roundtable. Feedback collected will be submitted to Minnesota’s congressional legislators and to the Obama Administration. Identify and prioritize top concerns or issues as provided by attendees. Learn from attendees why the identified issue are most in need to be addressed. Communicate the issues and concerns of the community with the White House and with policy makers. Identify methods the community can actively address concerns and issues identified. Join us in a meaningful discussion on the current immigration issues that face our community. Please contact us with any questions at capm@state.mn.us or call Brian Kao at 651-757-1742. The following message is from Raj Chaudhary, executive director of SEWA -Asian Indian Family Wellness. Due to the demand in health needs and services, we are now extending the Free Health Clinic to “The Sikh Society of Minnesota”. As you all know that for the past three years we have sustained our health monthly clinic at the Maple Grove Hindu Mandir of Minnesota.The program is very successful as it meets the needs of many of our community who would not have found health care in Minnesota. Our backbone of our programs is our Volunteers. Uncounted volunteer hours by our physicians and other professionals have contributed to the success of this health Clinics.